NAMM 2014: RHC Holdings, the parent company to the likes of ProCo and RoadHog, has announced a new update to its iconic RAT distortion pedal, the FAT RAT. The new stompbox is manufactured in the US (as opposed to China) and offers a choice of the original transistor or a MOSFET circuit, the latter of which the firm says supplies a smoother, more amp-like tone. Check out the full press release below and visit the RAT Distortion site for more information. ANAHEIM, JANUARY 24, 2014 ― RAT, an RHC Holdings Brand, is unveiling its new FAT RAT Guitar Pedal at the 2014 NAMM Show (Booth 4558). Building off the popularity and foundation of the original RAT Pedals, this new model is entirely built in the United States and features complete tonal flexibility through a choice of original or MOSFET clipping circuits. The MOSFET clipping section in the new pedal provides a subtle smoothing in the upper mids and a more amp-like tone throughout the range of the RAT, without loss of the basic feel of the classic pedal. The new FAT RAT Pedal also features a bass enhancement that increases the bass response, which is perfect for bassists and guitar players who tune down their instruments. The new pedal will now run on nine- to 18-volts of DC power, for users looking for the best headroom and audio fidelity. Lastly, the FAT RAT also includes a socketed op-amp, which allows users to easily change between the stock OP07DP and other popular chips. 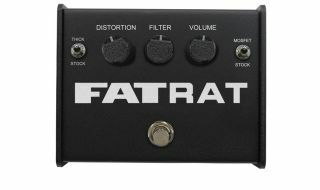 For more information on the RAT Pedal, please visit: www.ratdistortion.com.